Enjoy your sailing vacation with us! Here we go with the first cruise schedules we purpose for this year! We are not a big professional charter company, we don’t like bait-and-switch navigation or caravan-boats. We offer to you our enthusiasm, our passion for sea, our eager to sail to discover the wonders of the Mediterranean, and more, with our wonderful boat Blue Magic. You will be guests on board an unique sailing yacht, very special, made to sail and to host not more than eight people, included the crew. And the crew will offer you the royal treatment taking care of navigation, boat handling, breakfast, snacks, lunch and dinner. Shortly: just enjoy the sea and the sun, everything else it’s up to us. In fact there are 6 berths for guests. And this is our boat, so we take care of her as only the owners can do. We just suggest cruising itineraries which can always be modified either for the meteo situation or because you just wish to change them. Maybe you want to skip a leg because you want to stay one more day in a beautiful bay? Maybe you want to navigate more, or less, than programmed? We are here to make your vacation an unic one, just like our Blue Magic. Please note that in some of our cruises we point out the possibility to dive or to get assisted snorkeling sessions with Giusy, who is a marine biology instructor and a scuba guide. Please contact us and we’ll be happy to give you any detail you might need. Sailing among nature and history in the wonderful Tuscany, discovering the pearls of the Tuscan Archipelago. This is pur proposal for April and May, beginning with Easter Holidays. We offer mini-cruises of 3-5 days and weekends. 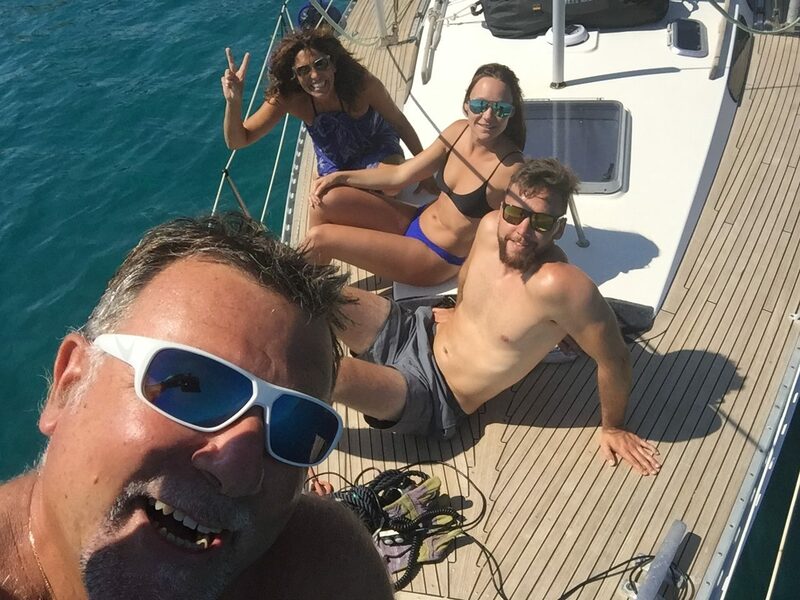 Enjoy our ALL INCLUSIVE offer, the perfect choice for those who approach a sailboat for the first time and want to learn how to take their first steps on a boat. But also for those who are already good at sailing and want to know stunning places. Our cruise starts from Marina di Salivoli, a cozy little port just in front of Elba, and from there we sail to discover Elba and Capraia most beautiful spots: Portoferraio, Porto Azzurro, Marciana Marina, Fetovaia, Cavoli, San’Andrea, the tiny village of Capraia, which also offer many opportunities for trekking and biking. Giusy, co-skipper and hostess, will pamper you with her aperitifs, and her best recipes. And you can enjoy your holiday, between excitement and relaxation. Sailing and breathtaking views in the unspoilt Ogliastra with our ALL INCLUSIVE plan. This is, too, the perfect choice for those who approach a sailboat for the first time and want to learn how to take their first steps on a boat. But also for those who are already good at sailing and want to know wonderful new places. Our cruise starts from Santa Maria Navarrese, our base, and from there we sail to discover Ogliastra: the magnificent scenery of the cliffs of Capo Montesanto, the coves of Cala Goloritze or Cala Mariolu, the beaches of Orri and Cea, the Port Frailis bay, will be the spectacular scenario of this 2 or 4 days cruise. And ,depending on the weather, you can opt for a longer route, northward or southward. Giusy, co-skipper and hostess, will pamper you with her aperitifs, and her best recipes. And you can enjoy your holiday, between excitement and relaxation. Traveling on a sailing boat from Ogliastra to the Maddalena Archipelago: it is the best way to discover this breathtaking land and it is something that leaves its mark. We are talking about unique places, often impossible to reach if not by sea. We start from Santa Maria Navarrese and the wonderful coves of Golfo di Orosei – Cala Goloritzè, Cala Mariou, Cala degli Innamorati, the legendary Cala Luna. And for lovers of diving and snorkeling, Giusy – our hostess who is also a marine biology instructor – will be able to advise the most beautiful dives in the Ogliastra diving spots, where a well-equipped diving center is active. And then, sails up towards the marine park of Tavolara with fabulous nights in enchanted places like Capo Comino or Capo Coda Cavallo. And then to the magic Archipelago of La Maddalena, in the heart of Costa Smeralda: Caprera, Spargi, Budelli, Razzoli and Santa Maria. We will be able to explore them looking for the most beautiful and less traveled corners, in the best season: summer is already very hot, but we are still far from the crowds of August and these islands are still livable. We finish pure cruise at Olbia after a week of sun, sea and many emotions. East Sardinia on a sailing boat: we have to discover so many little bays descending along the east coast of the island, far from the touristic assault of the North. And we’ll have also the chance to swim with Giusy in the waters of Ogliastra and the marine park of Villasimius to enjoy a guided snorkeling or, for those who do scuba diving, a dive among giant groupers. Departure from Santa Maria Navarrese on Sunday and immediately to the discovery of the Gulf of Orosei, to Cala Goloritzè or Cala Mariolu, natural paradises still intact. No access roads, here only boats and trained trekkers arrive. And nearby there are breathtaking coves like Cala Luna and Cala delle Sorgenti, Cala Sisine, the swimming pools of Venus. From here towards Cala Sinzias, Cala Molentis, and Villasimius passing through Capo Ferrato, another beautiful harbor to spend enchanted nights under the stars. 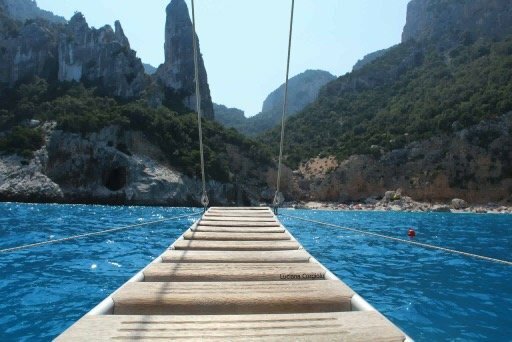 In Cagliari it will be difficult to get off the boat ..
“Ferragosto” – mid summer holiday in Italy – on a sailing boat, discovering South Sardinia. Here is a fantastic cruise for those who want to discover with us the less crowded and better preserved part of the island: the coves around Capo Spartivento are still a privilege for a few. Sailing along these coasts is the best way to discover this fabulous land, made of blue bays, Caribbean sand beaches, turquoise and transparent sea. You will not believe your eyes when we’ll drop the anchor in Cala Zafferano or Porto Pino. You do not realize the marine wonders we have in Italy until you get here for the first time. And believe me, every time we come back, we feel the same emotion. Cruise very very comfortable for this August holiday on a sailboat: departure and arrival from Cagliari on Saturday, then Sunday immediately to Cape Spartivento after a swim in front of the ancient ruins of Nora. You won’t forget the first night in a place that we call “the bay of the two dolphins”, guess why … But you will not even forget the second … And then Chia and Capo Malfatano. And what about the magic of Carloforte? Here it is a must to taste the bluefin tuna and of course visit the “carruggi” of this Ligurian oasis in the heart of Sardinia. Amazing. Welcome to the South! South Sardinia on a sailing boat. Many know the Maddalena Archipelago, but the South of Sardinia, the wildest part of the island, is still a privilege for the few. Here is the right cruise to discover this fabulous land, made of blue bays, beaches of Caribbean sand, turquoise and transparent sea. This is also a comfortable comfortable cruise, with skipper, hostess and delicacies, departure from Cagliari and arrival at our Santa Maria Navarrese base. We will make the first stop in the bay in one of the magnificent bays of Villasimius, Porto Giunco or Campolongu. Then Punta Molentis, Cala Sinzias, Capo Ferrato for other nights under the stars and baths to remember. We will stop to refuel in Porto Corallo and then continue to Santa Maria Navarrese and visit the famous coves of the Gulf of Orosei, the beaches of Cea and Orri, the islets of Ogliastra. You will discover a breathtaking Sardinia, with breathtaking scenarios, far from the crazy crowd of the North. Write us to know detailed itineraries and prices!